Early Intervention (EI) partners with families of infants and toddlers with developmental delays and disabilities to enhance their child’s development and learning through everyday activities that are important to the child and family. The goal of EI is to help families become more competent and confident in helping their child develop and learn. One way we measure progress toward this goal is by gathering information about three child outcomes. Building positive social-emotional skills and relationships, which includes how children interact and play with other children and adults, how they show their feelings, and how they follow social rules. Acquiring and using knowledge and skills, which includes how children understand basic concepts, learn new things, solve problems, and use words or other ways to communicate. Taking appropriate action to meet their needs, which includes how children become more independent by learning to move on their own, feed themselves, ask for assistance, begin to get dressed, and take care of basic needs. Observe differences in what your child is able to do in different settings (home, day care) and with different people (you, siblings, playmates, caregivers). 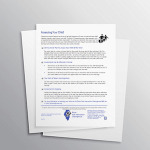 Be ready to share what you know about your child with your EI team members. Ask questions such as: What are the next skills we should be looking for? How do I know when my child is making progress? Celebrate progress with your child, your family, and your EI team. How will this help you as a parent/guardian? Become more confident about observing your child and monitoring his progress. Understand more how her skills compare with other children her age. Contribute more to team discussions about your child’s strengths. Discussing these three outcomes with other team members can provide useful information about your child’s progress over time. By sharing information, you are not only helping your own child but also assisting the EI program in identifying ways to improve EI services for all families.